Ever wondered how to create websites? Where to find courses that will teach you how to build your own websites? Where to find and how to use software for creating websites? Websites, why do we need them? No matter how small or how large your business, if you have a business or want to share information with anyone, you need a website and should be on the internet. Gone are the days when advertising happened in the printed media and on television only. If you have a business, people expect to find your business on the internet. Having a professional website and being on the internet is equivalent to your business being visible and contactable by any client 24/7. Not having a website is called business suicide. Not having a business website causes businesses to lose potential customers and profit. Almost every person has a cell phone with which they can surf the internet. A Cell phone is a status symbol, it is a must have, and people use them to their full potential. How much business have you lost by not being on the web? Every time your customer search for you on the internet and cannot find you, they think that you do not exist, cannot afford a website or is not knowledgeable enough to have a website. Not having a website is like wearing a bloomer instead of a bikini! Having a website is definitely in! Being able to design and build your own website is definitely an added advantage, especially if your competition does not have a website. People lose confidence, interest and trust in a business that cannot be found on the internet. In this modern, technology driven area, people expect businesses and people to at least have an e-mail address. If you own a small business, you should have an e-mail address printed on all of your business cards, your business letterheads and any other literature that advertises your business. A website does not have to be flashy or cost a fortune to set up. You do not even have to learn how to work with difficult programs or buy expensive books. There are companies that can physically train a small business owner or an employee to make a website. I believe that doing something practically, you teach yourself more than just reading what to do in a web design manual. 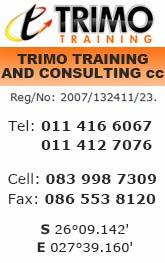 This training can be comfortably done in 3 to 5 days and is very cost effective. Just think of all the customers that you are losing because you do not have a website. On the next page of your website you can tell people about your business, when you started the business and about the people that run the business. This website page can be called an “About us” page. On the next page you can tell people what you sell, manufacture or produce. Here you will describe your products and the benefits of your products. You can include photographs and the cost of the items and any other information that you want your customers to know. These pages are called “Content Pages” and each will have the name of the product or service that your company provides. On the next page you can tell people where the business is situated, and how you can be contacted. This website page can be called the “Contact Us” page. Many businesses, especially new business start-ups in South Africa, think having a website is not important. They think that it is too expensive and that is sometimes the case. However, if you learn how to make a website, the knowledge is yours forever and you need never again pay for the services of someone else. You will be able to change and manage your own website as things change and grow in your business. In my opinion not having a business website is expensive. Not being visible and contactable means people do not know who you are or what you are selling! Websites work when you are asleep, when you are playing golf, when you are taking the children to school. The cost of having a website is negligible in comparison to the customers you are losing. If you learn how to make your own website and how to keep your own website updated, this is the best solution. In terms of cost of website making and website training there is a company that can teach you how to make your own website. The training includes everything that you will need to design your own website, to update your website and to upload your website pages to the internet. They will provide you with excellent service that will suit your budget, helping you to get your business website online in the quickest and easiest possible way. Websites are not created for business use only. Anyone can create websites and the web pages can contain anything except articles or something that is prohibited by law. The software for creating websites is easily available and a disk containing the web design software is usually included in website training courses. This web design software usually also include other resources and information such as web design tools. Building websites for others can be a very lucrative business and will become even more so as people start to realize the power of the web.